I had pulled myself to my feet and continued on my hopeless quest for survival. I went left at the T, leaving the swaying conduit and it’s dancing sparks behind me. My eyes had adjusted to the oppressive darkness some, and I was able to navigate this corridor with much more ease than the maintenance hall. I hadn’t necessarily intended to go towards the sound I had heard earlier – maybe I still hadn’t. But here I was, standing out side of a door to what must have been an office or lab before our plunge to the bottom of the ocean. A little light brightly spilled out into the hallway from the crack under the door illuminating my feet and ankles. It was the first time I had looked at any piece of myself since the plunge. I hadn’t noticed till now, but my shoelaces were missing. At least most of them. There were tattered remnants dangling from the shoes – as if something had chewed them away. As strange as that discovery was – I couldn’t understand the delusional conversation happening behind this door. The woman seemed to shift gears and sounded as though she were weeping now. Her impassioned howl seemed to become an angry wail of bitterness and grief. I heard a massive crash as she presumably chucked something across the room. I could hear her footsteps as she nervously paced back and forth. Maybe she needed help? What should I do? It must have been out of habit – muscle memory, I suppose, or ridiculous social protocol that we mindlessly employ – because there was suddenly a knock at the door. I looked down at the closed fist of my left hand and wondered to myself why I had done that. Did I want that madness to know I was out here? God knows what happened to Gregory! The shuffling stopped. The woman was instantly silent. The light from under the door disappeared with a flicker. My heart raced and my breaths became short and shallow. I could feel my pulse making the arteries in my throat dance in 3/4 time as I quickly pulled myself against the wall next to the door. I tried to make my profile as inconspicuous as possible – in the event she came out into the hall. I tried my best to be silent. The handle of the door was nickle, and parallel with the floor in its closed position. I watched as it was turned from the inside slowly until it was now perpendicular. I could hear the latch scrape against the inside of the frame as the mechanism delivered on its design and pulled the metal tongue into the door. The door moved only centimeters open into the hallway and then stopped. The nickel handle sprung back into place, indicating that someone had let go of it from the inside. The sound of it startled me, but I remained silent. This hallway was less cocked than the last, but it was still not level. Gravity took on the rest of the responsibility of opening the door. It slowly swung out into the hall where I was. I stood on the hinge side of the door with my back against the wall, so I capitalized on the cover and let the door make a little shadowy nook for myself. I stood there for what seemed an eternity as I waited for her to make a move. However, the longer I stood there, the more I got the sense that I was alone. Was I the one going mad? Did I just imagine that whole exchange? I knew I was as good as dead down here. The likelihood of escape seemed small. I knew I should be smart about this. I should probably just run the other way. But if I was going mad, wouldn’t it be better if I knew about it? I moved out from the corner and around the door into the doorway. The room in front of me was rather large. It must gave been a lab. Medical beds were turned over in the darkness, and the corners of the room were littered with scanning equipment, empty flasks, and surgical tools. There was a stench of rotting food. A sour smell that pervaded the air. But I seemed to be alone. I was terrified and relieved. Relieved not to have a confrontation with an insane person, and terrified that I might be going insane myself. I walked into the room. Out of habit, my right hand reached for where a light switch would be. Even as I reached I realized how foolish it was to think anything would happen. So you can imagine why I was startled enough to yelp out loud when the only two florescent bulbs not broken flickered on. There was a slight pop and hum as they came to life – as weak a life as they appeared to be having. The light sputtered and flowed through the tubes as they struggled to illuminate the room – but this was the most light my eyes had experienced since I woke up, so to me the experience was blinding. I covered my eyes with my left arm as I let them adjust. 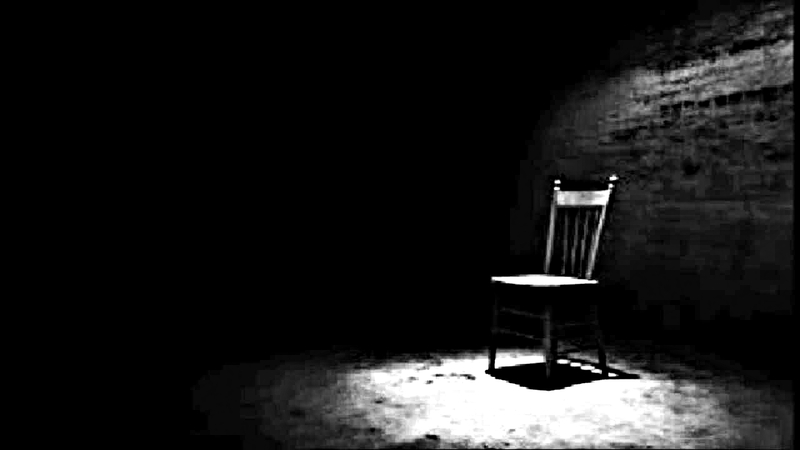 When I felt comfortable enough to drop my arm, I noticed, for the first time, that there was an empty chair sitting in the middle of the room. It was the only thing in here not turned over or wrecked from the plunge. It was very odd to me that it had not been toppled – more so that it was so symmetrically located in the center of this room – facing the door. Even stranger was what I found lying on the seat of the chair. I picked up a folded card. On the cover of the thick card-stock in bold calligraphy were the words, “Happy Anniversary.” My mind couldn’t process all the strangeness fast enough – I had already opened the card. The card was splattered in red ink.